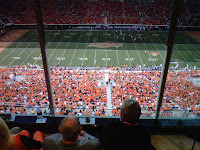 College Football......Boone Pickens Style...Trust Me, It's Good | Gina Miller's Blog - A working mom's blog about fitness, travel, handbags & beauty. There are times you shoot a story and it’s just fine. It’s lovely. You learn a thing or two and move on from there. Then there are times you spend an evening learning more than you ever thought you would and come away amazed. The latter was the experience I had shooting a piece with Dallas billionaire Boone Pickens. Here's the link to the story that aired on CBS11. I’ve wanted to attend an Oklahoma State football game with the 1951 graduate for years figuring a story would offer a unique perspective and interest viewers. Our schedules finally aligned and I got the chance to travel with him, some of his employees, friends and colleagues to Stillwater for the Cowboys game against Texas A&M. I knew it would be fun but I didn’t know I would learn so much about this 82-year old man who has the stamina and character of someone 50 years his junior. Once he’s off the plane, Pickens does a fair amount of entertaining and greeting the hoards of people who want to meet him. From the OSU athletic director to the basketball coach to various school personnel, they all wanted to say hello. This was before Pickens had even walked into his eponymous facility. Once he was inside Boone Pickens Stadium and gotten his usual pre-game ice cream and tried to make his way to his suite, he was stopped time and again by friends, well-wishers and, frankly, fans. I walked around the stadium before the game to talk to people on campus. He has rock star status. One tipsy frat told me “T. Boone is my homie!!! !” Okay, a little beer might have gotten said frat a little more fired up than usual but I got the impression most of the students feel the same way. He has a real connection with the student body. They think he’s cool. 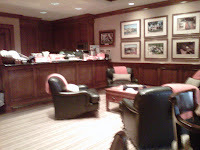 His suite, located on the 50-yard line and next to the university president’s box, is honestly one of the nicest I’ve ever seen. 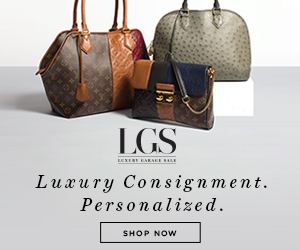 Rich wood cabinets, gorgeous wallpaper and beautiful furniture decorate the luxury box. That’s just the beginning. The food was amazing: freshly picked tomatoes and squash from a local farmer’s market were served for the halftime dinner along with some beautiful steak. Dried fruit, various dips and these amazing, impossible to stop eating jalapeno-cheddar pretzel bites served as appetizers. I bring all this to your attention because Pickens doesn’t do anything halfheartedly. 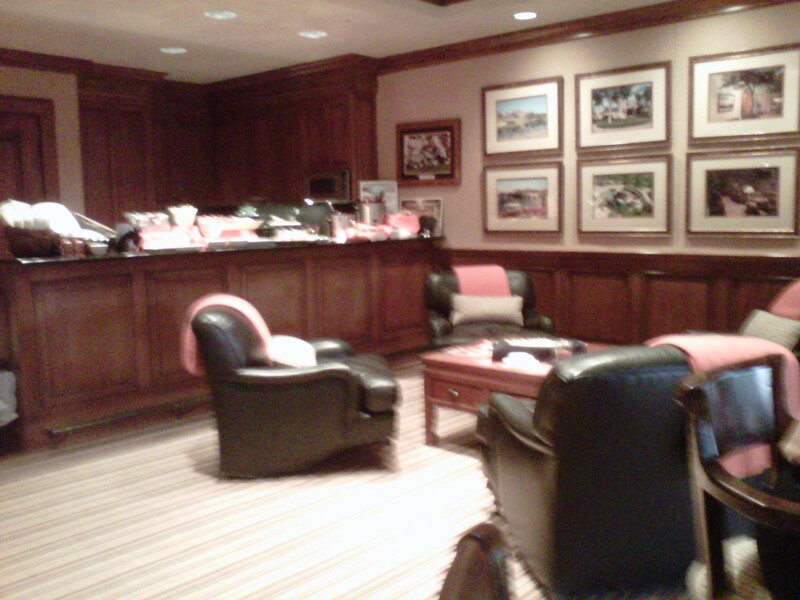 From his business interests to his passion for Oklahoma State, he’s all in at all times. We had a microphone on Pickens while he watched the game. We typically get the best stuff for our stories during these moments because many people forget they are on-camera. 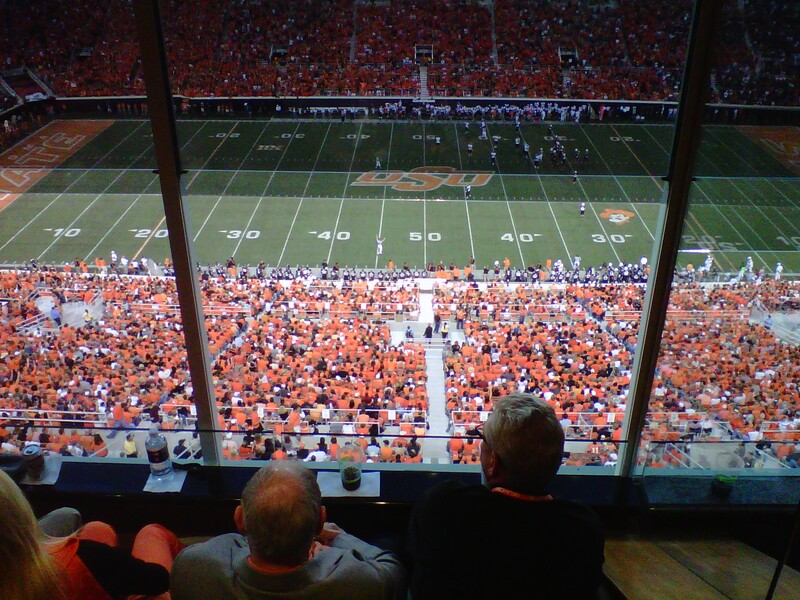 Pickens watched the Texas A&M/Oklahoma State game with binoculars. When I was logging the tapes we shot, I could hear him telling his wife, Madeleine, information on the players any college football scout would appreciate. He understood the plays and knew in-depth details about almost every OSU player. He’s a man concerned with details. He’s given around half a billion (with a B) dollars to Oklahoma State University. That money has gone towards both the athletic and academic programs. I asked him what was important to him in regards to the athletic department and the answer surprised me. Yes, the facilities are vital and, to me, Boone Pickens Stadium seems like the college football equivalent of JerryWorld. Beyond that, Pickens is focused on two other elements: the food and beds. He wants the athletes to eat well and knows how important it is to their success. He also knows how much it costs: about a million bucks a year. Pickens has had former Cowboys players who are now in the NFL tell him they miss the beds at Oklahoma State more than anything else. We got back from Stillwater around 11:30 pm. On the way to the airport, I asked him what his upcoming schedule was like. He had a full work day on Friday before flying to his ranch later that evening for a function on Saturday. Then it was on to California for an event at the Ronald Reagan Library, followed by meetings in Washington D.C. before heading back to Dallas for a Thursday morning breakfast meeting. I was tired from the trip and exhausted just hearing his schedule. How does he do it? 5-Hour Energy? Starbucks triple espressos? My personal fave, Tall Skinny Caramel Lattes? No. Pickens has never had a cup of coffee in his life. He’ll drink herbal tea. He eats pretty well, save for an admitted sweet tooth. I think it all goes back to a certain passion for winning. Simply put, that’s his philosophy and he seemingly applies it to every, single thing he does. There were some good ones that night. It was hard to pick one. Pickens is one of the most even keel men I've met, excuding a calm confidence. He would cheer and "wave the wheat" when Oklahoma State scored. He was cordial and friendly, yet pretty business-like during the game except when the band played outside his suite. Members of the OSU band stopped by his suite to perform. Pickens had grabbed a snack and was heading back to his Cowboy-orange leather seats when heard the band just outside his suite entrance. “That’s my band!” he exclaimed with a huge smile. Then he proceeds to go into the hallway of suite level at Boone Pickens Stadium and not just listen to the band. No no no, to borrow a phrase from Roy Williams. Pickens went out there to lead the band. He knew the words, he knew what to do and he proved to me, once again, that billionaires, at least this one, simply do it better.